The City Council violated Nevada open meeting law during its city attorney negotiations, according to Nevada Attorney General Adam Laxalt. File City Council has been found in violation of the open meeting law for not providing resumes to the public as part of its supporting materials when interviewing four candidates for the city attorney position on Sept. 20, including Steve Morris, who was ultimately selected. In his opinion released Friday, Laxalt said the city failed to provide supporting material regarding the backgrounds of the four candidates for the position. Resumes and interview questions for the candidates were to be available at the beginning of the council’s Sept. 20 meeting, according to the agenda packet. They were not, nor were they provided when requested by several people. In response, six residents filed open meeting law complaints with the attorney general’s office. “We asked for the stuff, and the people at City Hall said they didn’t have it, and they should have,” said Adele Sherwood, one of the residents who filed a complaint. Sherwood added that elected officials should serve the people who voted for them. Laxalt’s written opinion said that about 30 minutes before the meeting, resident Neal Siniakin met with City Clerk Lorenne Krumm and asked for copies of the resumes. At that time, Krumm said she did not have them and would provide them to him when she received them. He and other residents also asked for the resumes right before the meeting and during the public comment periods. Laxalt said that before the meeting Sept. 20, council members were given binders featuring supporting materials that included interview questions and resumes for the city attorney candidates and that during the meeting, Mayor Rod Woodbury explained the city attorney selection process, stating that council members had the “applications, resumes and writing samples” for them. Nevada law requires public bodies to make a copy of those supporting materials available to the public at the same time they are provided to council members. “As the council members received the resumes before or at the time of the Sept. 20, 2017, meeting, the council was required to make a copy of the resumes available to members of the public requesting them at the same time the members received the resumes,” wrote Laxalt in his opinion. By not providing the resumes to public, Laxalt said, the council violated the open meeting law. The finding will be placed on the council’s next agenda to formally acknowledge the violation, and Laxalt’s written opinion will be included as supporting material in the agenda packet. 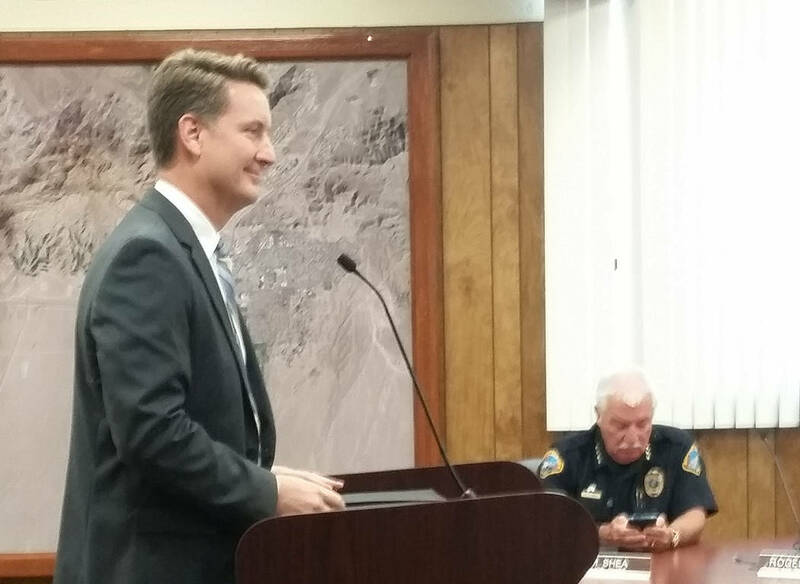 The resumes were available for the council’s next meeting, Sept. 26, when members, in a divided vote, selected acting City Attorney Steve Morris for the permanent position. Though complaints were also filed about that session, Laxalt said the council did not violate the open meeting law then. In his opinion, Laxalt added that the council and the city clerk’s office treated residents’ request for the resumes as a public records request rather than a supporting materials request. Despite state law allowing a public body to take five business days to issue its response to a public records request, that does not negate the open meeting law’s requirement to make supporting materials available to the public when they are given to the council members, Laxalt wrote. In another statement, Manteris said the resume request was treated that way because it was made to the city clerk’s office, which did not have the resumes. They were supplied to the council by the human resources department. Manteris also said there was some miscommunication before the meeting between human resources and the clerk’s office. Usually the department overseeing an agenda item is responsible for providing backup material to the council and the public. Because of the open meeting law complaints, Morris has held back on finalizing terms of his employment contract with the city, noting that the vote to hire him could have been voided. However, that could have happened only within 60 days of the vote, and that period expired at the end of November. The City Council is expected to discuss Morris’ proposed contract at its Feb. 27 meeting.